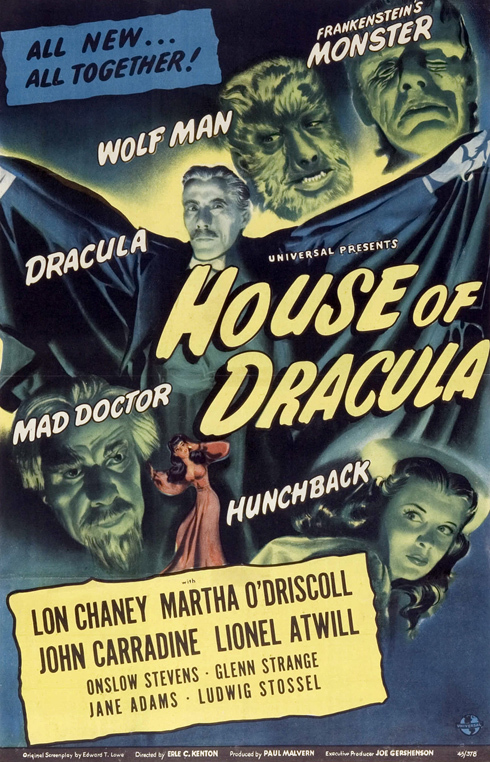 House of Dracula (1945) was the natural result of the success of the previous year’s monsterthon, House of Frankenstein. 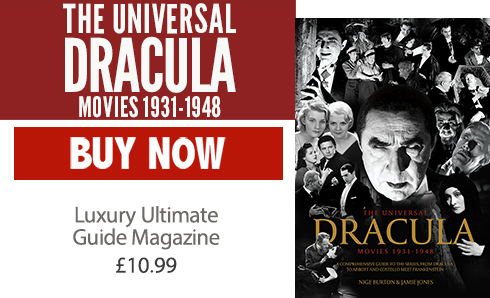 Universal were determined to wring every last ounce of mileage out of their staple monsters, a fact which, although it seemed to make much of their combined potential, actually hastened their completely running out of steam. After House of Dracula, there was really nowhere for them to go, save the inevitable encounter with Abbott and Costello. Much derided and often ridiculed, House of Dracula actually has a great deal going for it including some cast iron performances: Lon Chaney is excellent as the tormented Larry Talbot in his fourth outing as the character, John Carradine is once again superbly cadaverous as Dracula, albeit more Kentucky gentleman than Transylvanian tyrant, and Onslow Stevens brings a hypnotic mix of pathos and madness to the Jekyll and Hyde role of Dr Franz Edelmann. Originally slated for direction by Ford Beebe, allegedly from a script entitled The Wolf Man vs Dracula (although no evidence of such a document can now be found), the eventual treatment was hacked together by Edward T Lowe, and proved to be a virtual rehash of House of Frankenstein. Ultimately, Erle C Kenton and Paul Malvern were handed a hybrid role of producer and director to whack between them in favour of Beebe; Universal loved their tried and tested formulae. 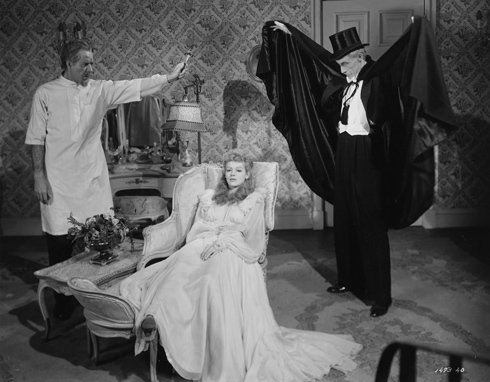 Although Kenton was a reliably safe pair of hands, and delivered a competent eerie ensemble on budget, one can’t help wondering what Beebe might have brought to the production, given the substance and style with which he imbued both Night Monster (1942) and Son of Dracula (1943). 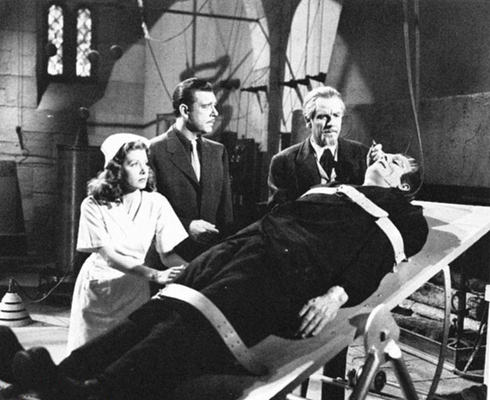 The main flaws of House of Dracula lie in its myriad improbabilities; Visaria is now apparently on-sea, Dracula and the Wolf Man come a-calling on Dr Edelmann like appointed patients which, even for coincidence, is a bridge that stretches a little too far, and the Monster (Glenn Strange), after sinking below the quicksand adjacent to Dr Niemann’s castle, is discovered still clutching the skeleton of that scientific worthy just below Edelmann’s abode, having presumably fetched up there by pure happenstance. 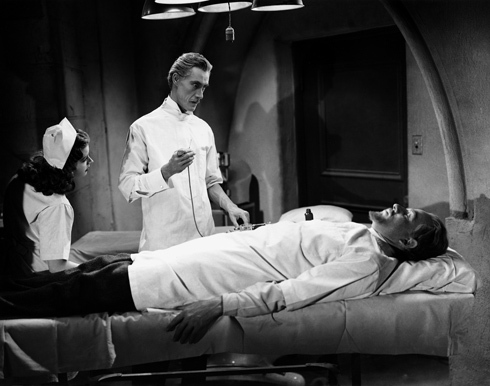 House of Dracula is the seventh film to feature the Frankenstein Monster but, sadly, by this stage, he is relegated to little more than prop status, reduced to laying around on makeshift operating tables waiting patiently to perform his function as a dramatic curtain call. That the fiery finale is lifted lock, stock and almost smoking barrel from The Ghost of Frankenstein (1942) is as clear an indication of how little respect Universal had for its time-served monsters as the fact that both Dracula and the Wolf Man turn up without so much as a hint as to how they survived their previous demises. 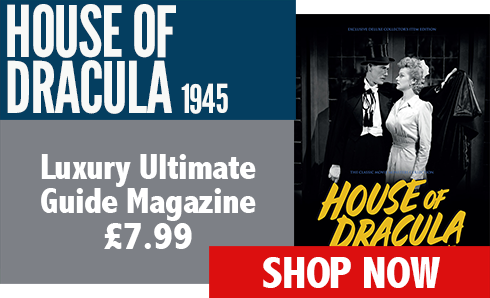 But enough of the brickbats – let us now celebrate what makes House of Dracula a truly great film and, in many ways, what made it such a fitting and right true end to a glorious double-era of wonderfully classic monsters. The almost tangible air of melancholy that pervades the film from its opening moments is deeply suggestive of something coming to an end, and that the movie as a whole feels like one great denouement paces it as a long goodbye. Although Dracula turns tables and decides not to pursue the cure which he had initially sought from Edelmann, there is something poetic about Larry Talbot finally being able to walk into the light of the full moon without sprouting a faceful of yak hair. Edelmann’s selfless approach to helping those whose seek it, apart from the moments when he is in the grip of Dracula’s infection, is sensitively played, and Stevens doesn’t over egg it. 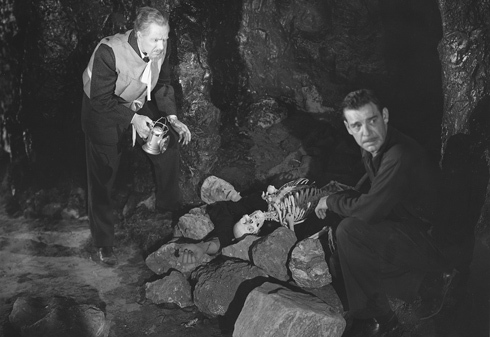 It was the final time, too, for the veteran Jack Pierce to make over the traditional monsters; Universal unceremoniously dumped him after House of Dracula, and he was replaced by Bud Westmore and his so in vogue latex look, which was quicker and cheaper than the grease paint and collodion. Jane Adams as Nina the hunchback nurse, and Martha O’Driscoll as assistant Miliza, are both effective support, but it’s a pity more is not done with the wonderful Lionel Atwill, who is practically sidelined in the role of Inspector Holtz. 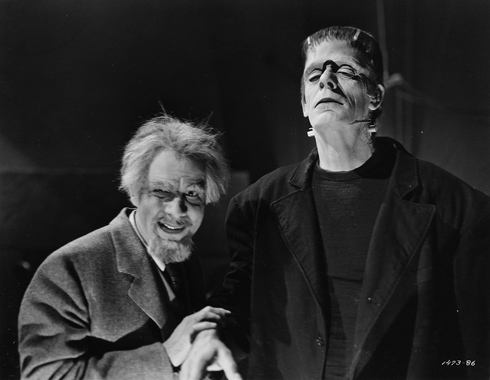 Poor Glenn Strange, arguably the best Frankenstein Monster since Karloff, is relegated pretty much to the benches, and feels almost called upon as a substitute at the eleventh hour, even then to be replaced with stock Chaney footage for his ultimate demise. This is a pity, and one can only conjecture what he may have done with a more meaty bite at the cherry. The evidence suggests he would have been fine. 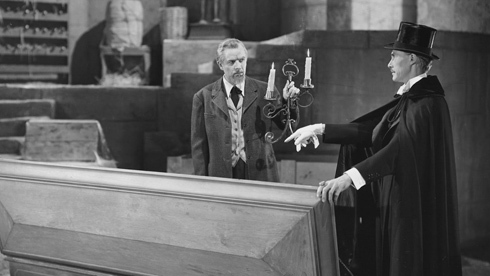 The belief that House of Dracula is an unworthy final instalment in the Universal Frankenstein, Dracula and Wolf Man sagas is held aloft by many, but it can only be a subject of speculation what the yardstick is for such a measurement. If we hark right back to the original 1931 Frankenstein, whilst there is not a shred of doubt about its classic status, it is hard to deny that it is inevitably dated; the age of the talkie had only just dawned, and production was not as slick as a decade and a half later. 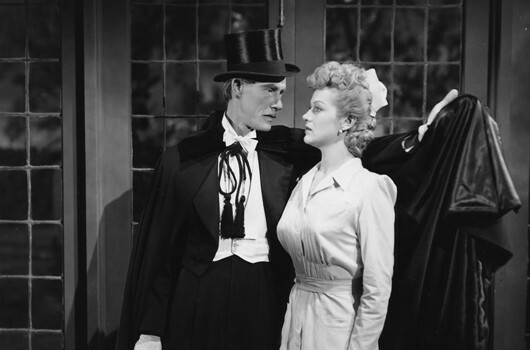 1935’s Bride of Frankenstein is unquestionably a stand alone masterpiece, but of the remaining stablemates, House of Dracula unequivocally holds its own. In a world where profits were everything and content played second fiddle, the film is still taken seriously by both its cast and crew. 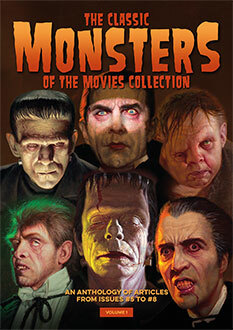 While it may well have benefitted from a bigger budget, a longer shoot and at least a second glance from Universal’s top brass, the set piece as a package is still delivered in true Universal Monster style. 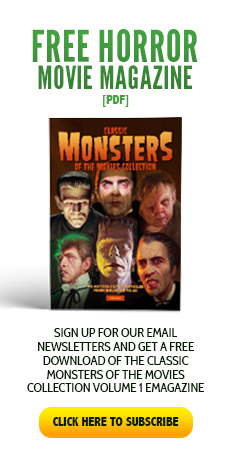 And we, the fans, don’t throw our love away on these films indiscriminately: it’s not like House of Dracula snuck in latterly when we weren’t looking; it was always there, right from the start – or shall we say the end – of this exhilarating, spooky phenomenon we call the Golden Age of Classic Monsters. Seeing Lon Chaney/Larry Talbot finally be able to walk in the Moonlight, is a true highlight in horror history. Director Erle C. Kenton films some very moody scenes using shadows like a real artist. I think this is a fine farewell to the series.